Today's 360° project is a true treat for the senses. It invites you to explore the nuances of fine design and the tangents that you have to take sometimes to create a piece of true art. Through the ages, stone and wood have been the most basic materials with which to build a house. It is easily available, considerably cost-efficient and of course, extremely eco-friendly. Did we mention versatile? Over the years, we've seen the combination of the two natural materials expressed in a plethora of shapes, textures and patterns, and it is ever-evolving. The stunning house we will explore today uses stone and wood to create an end result that is breathtaking and extremely intimate. Built over an area of 220sqm with a total cost of HK$6000, this impressive house leaves you with a feeling that it has its own unique personality. 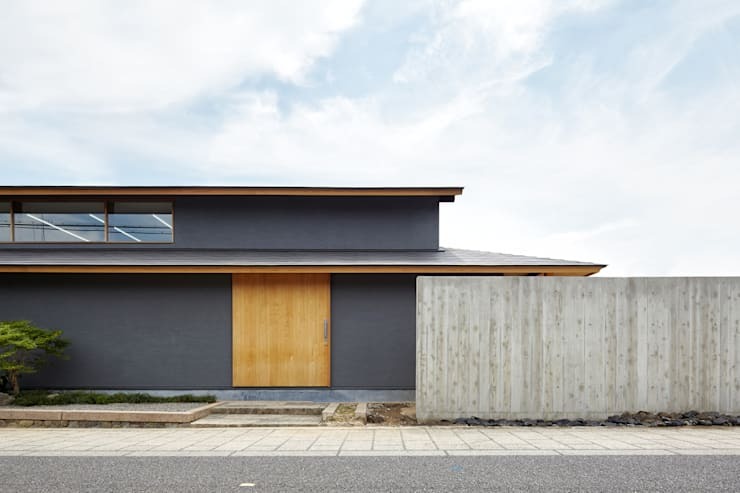 Neat, clean lines define the exterior of the house, but a slight twist of the wrist appears to have given this facade the illusion of a modern pagoda, complete with a tiered roof and two eaves. The simple slate grey exterior acts as a stark background for the solid wooden door. A concrete fence covers a portion of the house while the main entrance area is left open. 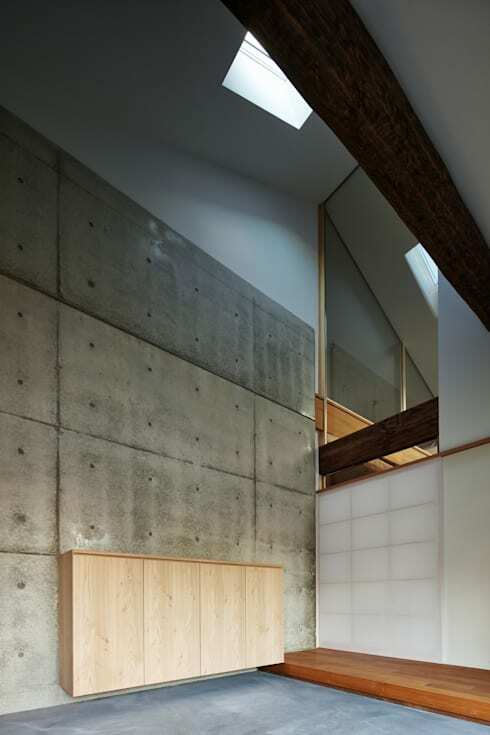 The inclusion of nature is an integral part of Japanese architecture, and this house is brimming with it. There's a stunning Zen garden and even a central courtyard that is overflowing with plants. The living room here is defined less by the furniture it holds and more by its unique architectural features. 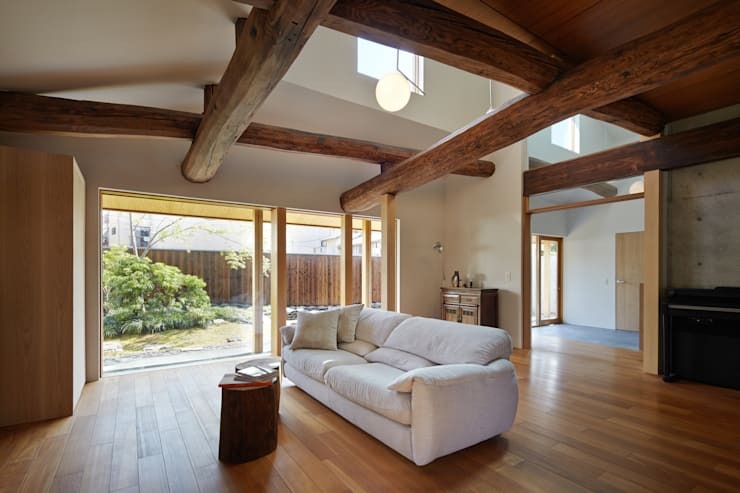 Check out those wooden beams on the ceiling, which then opens out onto the second floor keeping the space even airier! There are also vertical wooden beams hammered onto the ones on the ceiling that creates a harmonious flow to the whole space. Large glass windows ensure that there's a seamless transition between the interior and the exterior; where does one end and the other begin? By now, you've probably figured that light is as much a decor feature as everything else. Here, the gorgeously minimal kitchen overlooks the central courtyard. The natural wood tones seen both in the kitchen and dining area impart the whole space with a wonderful warmth and feeling of lightness. The wooden beams seen in the living room make an appearance here, this time acting as a unobtrusive divider between the different zones of this open-plan space. If you've been inspired by this space, and want to get more ideas, speak to our experts. We'll be the first ones to admit that we are completely obsessed over this stunner of a bathroom This outrageously simple space speaks volumes while paring it down to the bare minimum. Constructed almost entirely out of marble, this is a space that beckons you to stay for a bit longer… and longer… and, you get the idea. 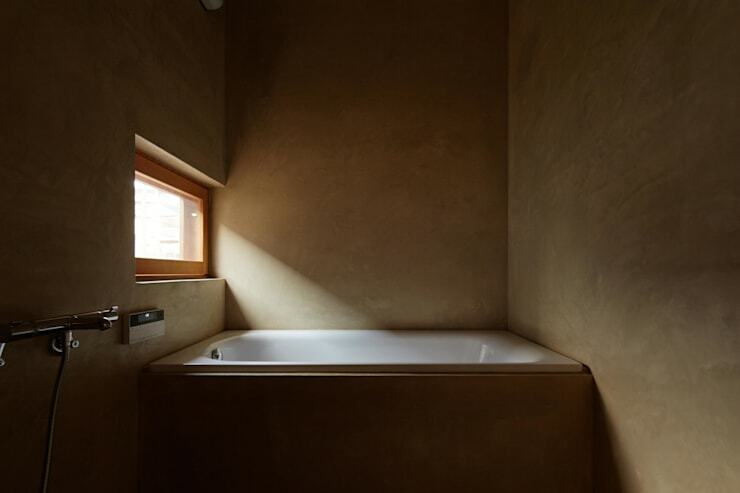 The only other design feature in this moody bathroom is a small window that is strategically placed above the bathtub. We end our tour by going back to the beginning, the entrance. A huge concrete wall spans the space between the first and second level and gives the hallway an industrial edge. The wooden storage cabinet here seems like the most unlikely but natural fit! The stark contrast between the two materials actually leads to a harmonious balance. 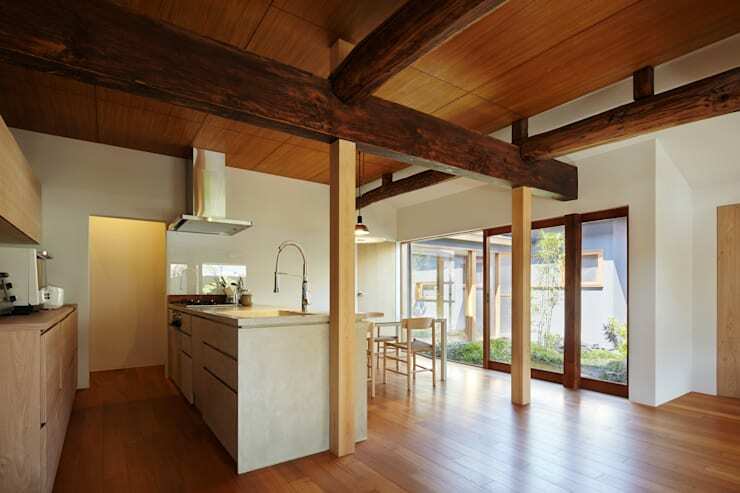 Check out another magic combination, white and wood, here: A Nordic family home in Japan. What did you think of this stunning stone-and-wood home?